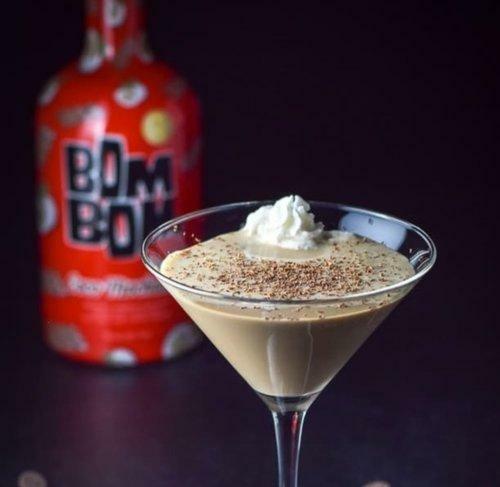 BOM BOM CAN MEAN MANY THINGS… IT MEANS GOOD GOOD IN PORTUGUESE, IT’S A SWEET CHOCOLATE TREAT IN BRAZIL, BUT PREHAPS MOST IMPORTANT TO US, IT’S SLANG FOR “MY SWEETHEART” IN SPAIN. AND OUR’S IS A STORY OF A PERFECT MATCH. A UNIQUE MIX OF LIFE’S FAVORITE FLAVORS & A DRINK DESIGNER’S PERSONAL QUEST TO WOO HIS FUTURE WIFE (IN WHAT OTHER WAY THAN A BOOZY DRINK?). WE BOTTLED THIS LOVE STORY — A FLAVOR NOW BROUGHT TO YOU AS COCO MOCHANUT — FOLLOWED SHORTLY WITH TWO DAIRY-FREE (BUT EQUALLY CREAMY!) FLAVORS: NILLI VANILLI MADE WITH ALMONDMILK & FULLY BAKED MADE WITH HEMP SEED MILK.